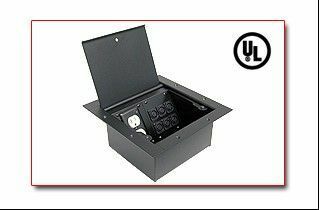 Audio floor boxes are a great way to hide and protect your electrical and audio or visual outlets. They are there when you need them but hidden out of view when you do not. You can have all of your important audio and visual outlets available in one convenient spot. Floor boxes keep the wires and outlets looking clean so you do not have to worry about hiding an unruly mess of cords. Floor boxes and wall plates are your answer to the wire dilemma. Arnev Products, Inc. is a Wisconsin based manufacturing company who provides audio floor boxes for both concrete and wood floors. We offer custom boxes in up to four sizes and can hold up to 50 devices including CAT, cable TV and speaker wires. We even offer round floor boxes that you generally see on stage for microphones and other stage equipment. Audio floor boxes are great for stages, DJ booths, conference rooms and flex space rooms. Once you are ready to add the finishing touches on your space, the next things to consider are switch plates and floor boxes. 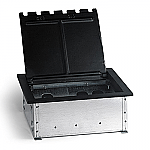 Although we do not manufacture the floor boxes, they are still made of high quality materials. We provide floor boxes as part of our catalog because we understand how difficult it can be to complete a room and not have all the necessary items readily available. Our products are made in America, down to our packaging. We take pride in knowing that we are an American-owned and operated company who provides quality products built in America for you. Whether you are looking to purchase switch plates, wall plates or audio floor boxes, you can be confident you are getting the highest quality products on the market with the widest selection of styles, colors, finishes, sizes and designs possible. We are so sure you will be happy with your audio floor boxes that we offer a 30-day money back guarantee. If the item you receive is not what you were expecting, please return it to us and we will refund your money minus shipping and a 30% restocking fee. Should your item come in damaged or defective, you can exchange it without penalty. We are committed to sending you quality items and we stand behind our products. If you are not happy for any reason, we will strive to help rectify the situation to keep you a satisfied customer. Please read the testimonials of many of our past, happy customers. Also, please review our warranty, privacy, return and refinishing policies so you are aware of our procedures. Finally, feel safe about ordering your audio floor boxes from us and know you will receive only the best American made products available today.